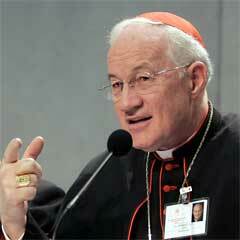 La Salette Journey: Cardinal Marc Ouellet: Equating Marriage and Homosexuality in Schools is "Harmful to Children." If only we in Boston has such a faithful Cardinal. Sadly, the true faith isn't being taught. Paul, I used to think you were being a little "over-the-top" with your warnings about a preparation for Antichrist taking place. Now I see just how accurate you have been. Wendy, there is a silent coup taking place. And it IS a preparation for the Antichrist. And so many Catholics don't see it. They're so busy living their lives and just trying to make a living that they often don't have the time to put the pieces of the puzzle together. Mr. Melanson does a great job here of exposing the lies and putting things into a clear perspective. We are in a most dangerous and precarious situation. Pray. Get the word out. There are dark forces building a new church which looks Catholic but which, in reality, is a humanitarian religion with its foundation in apostasy.